It’s finally those two magical weeks of the year when peaches are actually in season! I got about 16 big perfect peaches on sale, and made an attempt to eat as many as I could as they ripened. However, I am only one person and couldn’t accomplish this task, so I decided to make a peach dessert. When I was in Austin, Texas at the Salt Lick restaurant years ago, I remember trying both their blackberry and peach cobblers, and both were great! 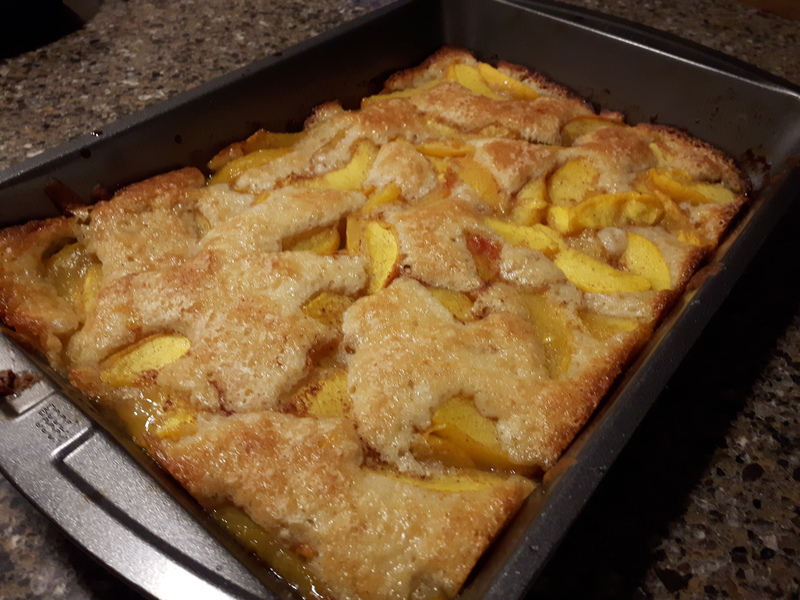 So when my mom said she was going to make a peach cobbler with her extra peaches, I thought I would give it a try as well as this solved my too-many-peaches problem. 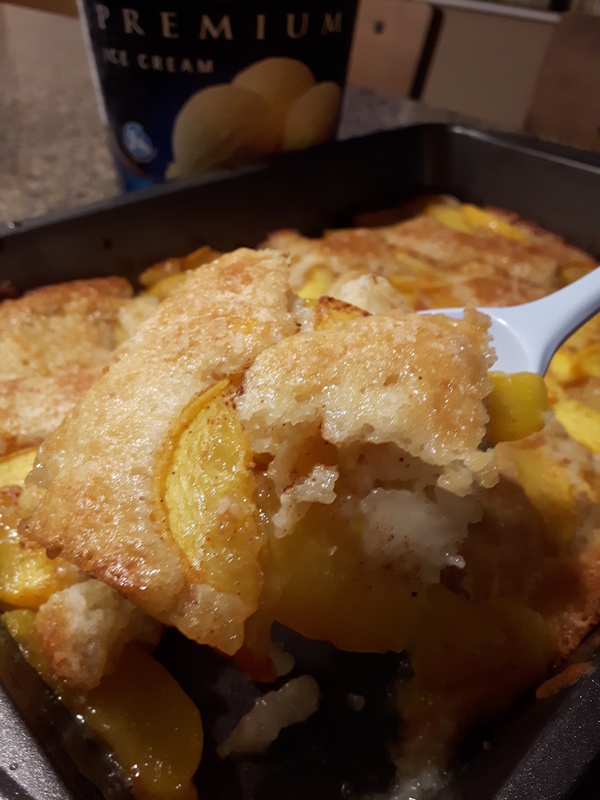 She sent me the Salt Lick peach cobbler recipe that she found online, and after a few tweaks (including reducing the sugar,) I gave it a shot too! A crisp (or crumble) is baked fruit topped with a sugar and oatmeal mixture that turns (you guessed it) crispy. A cobbler is fruit baked with a biscuit/cakey batter. When making a cobbler, you typically top the fruit with the batter. This recipe is different, as you put the fruit on top of the batter instead! I like it this way, and think it looks very pretty with the peaches sitting on top of the batter. This recipe is super quick and would be great dessert for any BBQ. So quick! 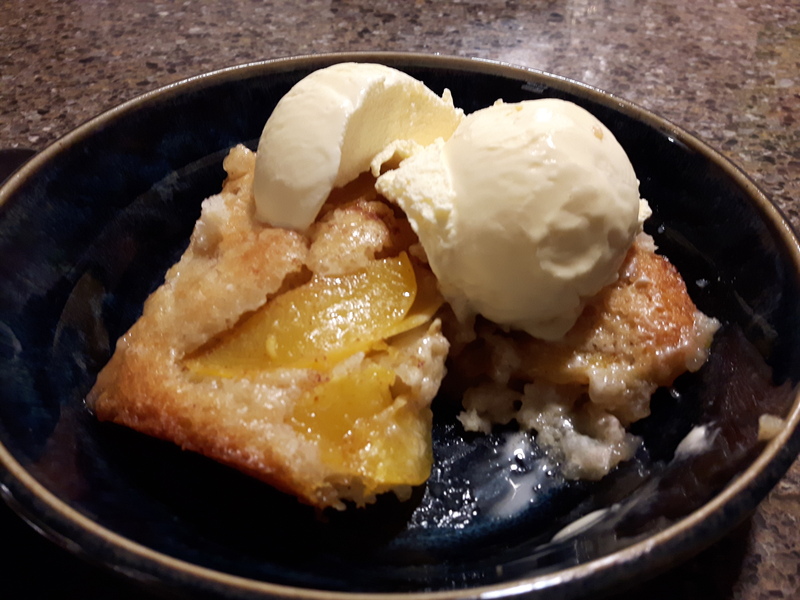 Get some peaches while you can and enjoy this summer dessert! Make peach mixture. Combine peaches, 2/3 cups sugar and spices. In a medium mixing bowl, combine flour, 2/3 cups sugar, baking powder, and salt. Mix well. In a separate bowl, beat egg with a fork and mix with milk and vanilla. Mix wet ingredients with dry. Pour batter on top of butter in baking pan. Try to spread the batter as evenly as possible. Scoop peaches evenly over batter. DO NOT MIX!! Bake for 35-45 minutes until batter comes to top and is golden brown. Serve with vanilla ice cream or whipping cream.